Register Now for The Beacons! The sooner you register, the sooner you can start training and fundraising. So what are you waiting for? Register for our ultimate charity trek and explore one of the UK’s most stunning National Parks, the Brecon Beacons. You pay the registration fee when booking your place on the challenge and then agree to raise the minimum amount of sponsorship for the charity of your choice. Your charity will then pay the additional challenge balance on your behalf. 50% of your minimum sponsorship must be received by your chosen charity 6 weeks before the challenge. The remaining 50% must be sent to your charity no later than 4 weeks prior to the challenge. You pay the registration fee when booking your place and then agree to pay the additional challenge balance no later than 4 weeks before the challenge. With this option you don’t have to commit to raising a set amount of sponsorship however we’d still encourage you to support a charity of your choice and raise as much as you possibly can! You pay the total discounted cost of the challenge in full when you book your place on the challenge. Again although there is no minimum sponsorship requirement, we’d still encourage you to raise funds for a charity of your choice! 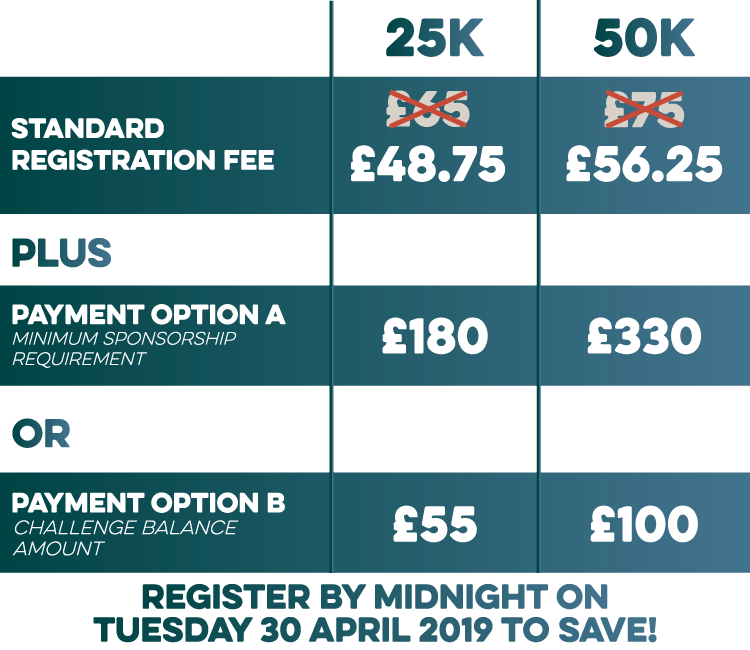 Save 25% on standard registration fees when you register before midnight on Tuesday 30 April 2019!